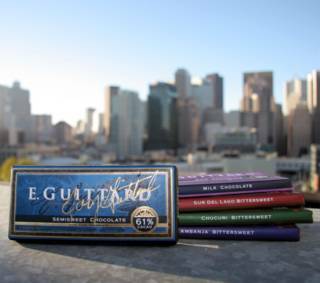 I found out from my San Francisco Slow Food news letter, that E Guittard were launching a new range of chocolate bars at Fog City News a few blocks from my house in San Francisco's downtown. It was said, that if you turned up during the specified hour and bought one each of their 5 new bars of chocolate (total $18), that Guittard would give a $100 donation to Slow Food for every customer who made the required purchase. This seemed like an easy way to raise one hundred bucks for a good cause, so some chocolate had to be purchased. Additionally, I had been wondering what to buy as a gift for another, very kind food blogger, Stella, who insisted on sending me some Ready Brek after I'd left a comment about it on one of her posts. I wanted a very San Francisco kind of pressie so what better than a new range of chocolate from a classic Bay Area Chocolatier? As you can see, Gary Guittard even signed one of the chocolate bars as a keep sake. I hope the chocolate finds a happy new home in Philadelphia (or in Stella). 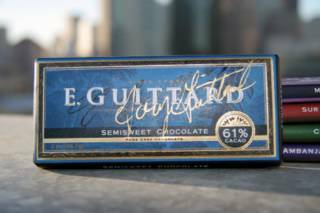 E Guittard chocolate. The new range. Pictured here at home in San Francisco but now on its way in the mail to Philly! Maybe Stella will be able to do a comparative taste test and report on the differences between the five chocolates. On the other hand, I think she should ignore that suggestion and just gobble it down and enjoy...! Slow Food reported that they raised $1900 from this event. What a great fundraiser! Are these bars going to be available to the public soon - I couldn't seem to find anything on Guittard's website. They are on general sale in the shop where they did the fundraiser. It's called Fog City News, 455 Market Street (at First), SF, 415-543-7400. Interestingly, the shop has quite a wide range of high end and fancy chocolates. They even gave me a card when I made my purchase - which was buy 10 or 12 bars and get one free!